© 2005,2013 SQUARE ENIX CO., LTD. All Rights Reserved. 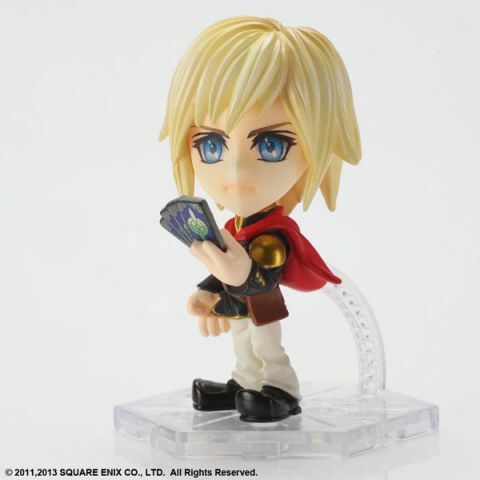 Popular characters Ace (FINAL FANTASY Type-0) Zidane Tribal (FINAL FANTASY IX) and Warrior of Light (FINAL FANTASY) from the FINAL FANTASY series make their appearance in super-deformed mini figures! Even at 3 inches tall, Square Enix Products' signature detail work and craftsmanship are apparent. With the potential to display even in a small space, these are a must-have item for FINAL FANTASY fans!